Divide the children into two equal teams. The first person in each line must put a large teddy bear under her chin and pass it to the next person in their line. The next child grabs the teddy with her chin, and on and on, until it gets to the end of the line. If the teddy is dropped, the team must start over. The team to pass the teddy from the front to the back of the line without dropping it wins! 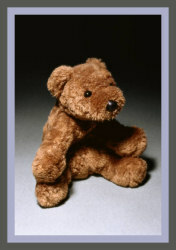 This teddy game is played just like hot potato, only a bear will be tossed instead. Have the children sit in a circle. Start the music (lively music works very well!). The children begin passing the teddy until the music stops. The child holding the 'hot' bear when the music stops is - out. Start the music again to begin another round. The rounds continue until two players remain. Next, a final round is played with these two players. When the music stops, the child not holding the bear wins. Place chairs in a circle (facing out). Set up one fewer chair than the number of children present. The game starts when the music is turned on and the children begin walking around the chairs. When the music stops the children will place their teddy bears into an empty seat. The teddy bear who doesn't have a seat to sit on is - out. The rounds continue until a single bear is place in the last remaining seat. This teddy wins! Hide an old teddy bear in the room. The guests begin looking for the teddy. You will call out 'hot' or 'cold' to the children as they search excitedly for the bear. The child who finds the old teddy wins! Start the game by having the children form two separate lines (equal sized teams). Place two bowls of M&Ms on the opposite end of the room. The first two children in each line are given a teddy bear to hold in the left arm, and a large wooden spoon to hold in the right hand. Call "GO! ", and these first two children will start quickly walking toward the bowl of M&Ms opposite them (no running allowed). They scoop out as many M&Ms as they can using only the hand with the spoon. They should be holding their teddies with the other arm. The children walk carefully back to their respective teams with their spoons full of M&M's. They deposit the M&Ms into another set of bowls - one sitting beside each line. The next round continues as the spoons and bears are quickly passed to the next children in each line, who then take-off to do the same. The group to completely transfer all of their M&Ms wins the game! Note: M&Ms dropped along the way go back into the bowl from which they were removed.